Powers: The Nova helmet grants certain special powers and abilities, including super strength, super speed, flight, energy projection & absorption, and the creation of force field. The second child of Menzin and Eve Bakian. She was very young when her mother gained Nova powers and left the planet. After the planet was ravaged she lived with her father in the woods. On the verge of death they are saved by the return of her mother Eve. 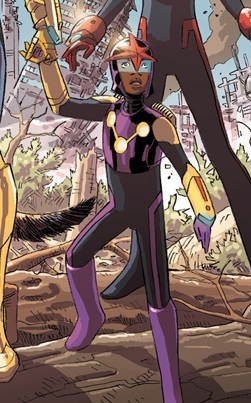 She was granted Nova Corps powers alongside her family and HER DOG Zig-Zag. Fayne received quick training before facing an army of bugs alongside her family.